Freddy Krueger Nightmare on Elm Street Cardboard Cutout - Our Nightmare on Elm Street Freddy Krueger Cardboard Standup is under our Nightmare on Elm Street t-shirts and merchandise section. If you or some you know loves the Nightmare on Elm Street horror movie series, then this cardboard stand up would make a great gift to any Nightmare on Elm Street fan. 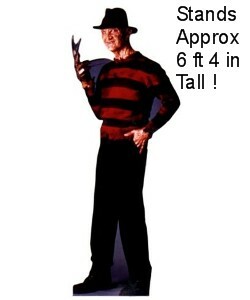 This Nightmare on Elm Street cardboard cut out features a life size image of Freddy Krueger that is approx 6 feet 4 inches tall. If you have any questions regarding our Nightmare on Elm Street Cardboard Cutout or any of our other Freddy Krueger merchandise, please email us with the name and product number.